Use Basic Gray & the color of your choice. The possibilities are endless, right? Well, I couldn't wait to use one of my new In Colors from Stampin' Up!, Crisp Cantaloupe. I thought it would be just the right color for the scene I wanted to create. It's been a while since I've done some sponging to create a scene. It's a technique that I love! I cut a mask from printer paper, using a Spellbinders die, then sponged on Crisp Cantalope and Basic Gray to create the sky. After that I tore a mask from cardstock, then sponged on Basic Black to create mountains. I drew in a few birds, stamped a sentiment and added 3 gray gems to finish my card. Oh, and added the Gray card base. I hope you'll join me and my awesomely talented team mates this week at Dynamic Duos. Links to their blogs are listed in my blog's side bar. 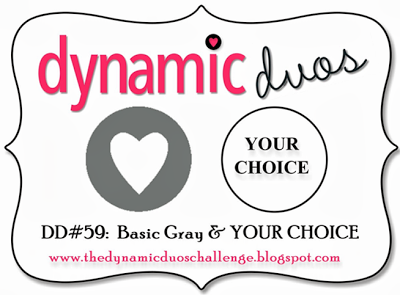 What color will you combine with Basic Gray? This is absolutely gorgeous, Susie! Such a serene little scene! Fantastic technique on your focal point :) Stunning Susie! Beautiful, Susie! Great blending of colours! What a fabulous technique Susie! Amazing scene!! Wow, I didn't notice the texture in the cardstock at first, but it's absolutely beautiful! Such an elegant and well executed design, Susie. It's gorgeous. Your masking and blending are beautiful! I love the color you chose to go with the gray. A gorgeous peaceful scene you created for your beautiful card! Wonderful job of sponging and masking, great job, Susie! Very nice clean & simple with a lot of white space. The scenery you created is so perfect for a sympathy card!